Perge (Perga in Greek) was once a very important city in the region of Pamphylia and the ancient ruins of Perge is located about 18 km east of Antalya near the town of Aksu. Perge is located near the Kestros River and was originally a port city on a major trade route. Perga was a wealthy Greek city during the Hellenistic period, however, when the whole bay area silted up, that ended Perga’s port city status and sea trade. According to the Acts of the Apostles, St Paul and his companion St Barnabas visited Perga twice in 46 AD and St Paul also delivered a sermon here. During the reign of Constantine the Great, Perga became an important centre of Christianity and it remained so through to the 6th century. Major construction works were carrried out in Perge during the Roman period and Perge grew into one of the most beautiful cities in Anatolia. The Romans built a stadium, a theatre and many other structures with the skill that the Romans are famous for. After an earthquake destroyed the city, it was abandoned. Although Perga became part of various Hellenistic kingdoms at different times in history, the only prominent standing structure left from this period is the much-photographed towering Hellenistic Gate, which unfortunately for us was partly covered in scaffolding. Much of the ruins that we see at Perge today are from the Roman era. Istanbul University have been excavating and restoring the Perge site since 1946 and when we visited we saw the painstaking work being carried out in the heat of the day. The statues and reliefs recovered in the excavations are on display at Antalya Museum – in fact most of the statues on display in Antalya Museum are from Perge. Although the restoration project seems endless, from the work done so far, the site is impressive. A good place to view the Perge site is from the acropolis behind the Nymphaeum (water fountain). From the elevated point you will have a fine panoramic view of the grand colonnaded marble street and the water channel that transports water from the Nymphaeum to the city and shops along the boulevard. The flowing water also helps to keep the city cool during the hot season. Other impressive structures at Perga include a theatre with a capacity for 12,000 spectators. The theatre’s frieze of Neptune with sea creatures can be seen in the Antalya Archaelogical Museum. There was also a stadium measuring 34 square metres and the Agora which was the commercial and political centre of the city. Like all ancient Roman cities, its structures also include the city walls, gymnasium, Roman Baths and Roman gates. We visited Perge on a tour and unfortunately there’s no easy way of getting here on your own. To get here by public transport, you can catch a minibus from the bus terminal (Otogar) in Antalya to the village of Aksu and then it’s a 2 km walk north to Perge. You may get lucky and hitch a ride or find a taxi to take you there. But Perge is a significant ancient site and certainly worth visiting. 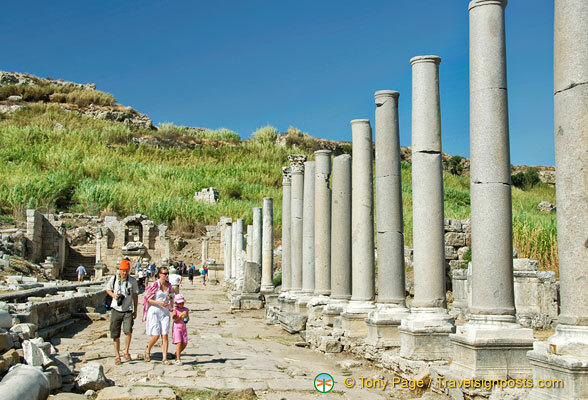 See the sites of Perge at Travelsignposts Perge photo gallery.